Zero Waste War: Why am I writing this blog? Why a Zero Waste War? Why am I writing this blog? Why a Zero Waste War? "Why do you want to write a blog about trash?" "Why would anyone want to read a blog about trash? How boring"
"Why do you care, we are all going to die anyway?" My first reaction was to speak defensively and to feel hurt. Instead, I explained that my blog wasn't just about trash. My main purpose for this blog is to motivate my children to use less trash in their daily lives, to send some awareness regarding the effects that plastic and trash have on our planet and to provide some simple solutions/alternatives to those that have a desire to change. The first two pictures above are of the Carmel Beach, where I was visiting family this past week. The third picture is of Kamilo Beach in Hawaii, which is riddled with 15 to 20 tons of trash that washes to shore yearly. To me, the Carmel Beach is the most beautiful place on in the world. The beaches in this area are extremely clean and do not have plastic or trash washing up to shore yet. However, those that live by Kamilo Beach aren't as lucky and do not get to enjoy the beach. 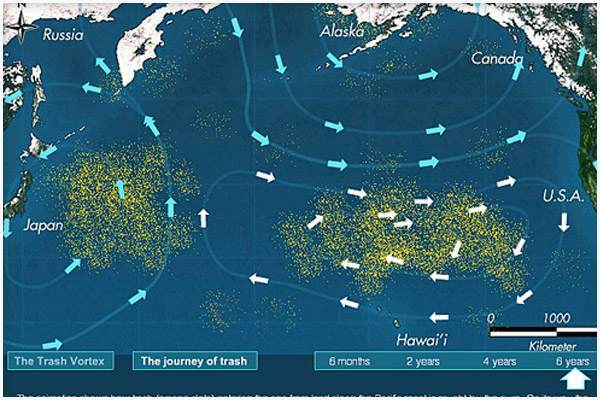 This is because of the Great Pacific Garbage Patch. 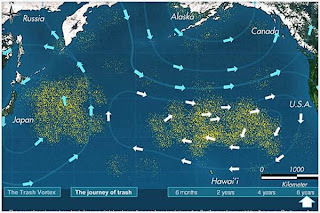 The picture below is of the Great Pacific Garbage Patch. The Garbage Patch has two large masses of garbage. The Eastern part of the Garbage Patch, that floats between California and Hawaii, is estimated to be two times larger than the state of Texas. In some areas of the ocean, the amount of plastic outweighs plankton in a six to one ration. Of the trash swirling in the ocean, 90% is some form of plastic. The United Nations Environment Program estimated in 2006 that every square mile of ocean hosts 46,000 pieces of floating plastic [source: UN Environment Program] Why is this bad? First, most plastic isn't biodegradable, which means it can take hundreds of years to break down. Second, plastic is killing our marine life in and out of the ocean. More than a million birds and marine animals die each year by consuming or getting caught in plastic. Third, beaches are feeling this effect because the trash is getting washed up to shore. 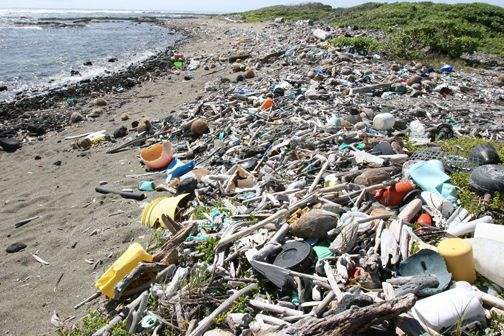 Some of the beaches in Hawaii are under five to ten feet of trash. My goal is to do as much as possible each day by watching my own waste and by spreading awareness to others. I hope that my grandchildren (not yet born) and future generations can enjoy beaches, such as Carmel Beach, in the same manner as I have.